His name is Willem de Konigh. The 33-year-old Dutch billionaire who was her first crush, her first lover, and her first heartbreak. Her name is Serenity Raleigh. The 19-year-old childhood friend whose innocence he had stolen, and whose heart he had shattered…only to realize that hurting her meant hurting himself more. Willem is determined to do everything to earn Serenity’s forgiveness and make her love him again. What if Serenity has found someone else? This is the final book of Willem and Serenity’s love story. *I was gifted this by the author in exchange for an honest review. * THAT ENDING! 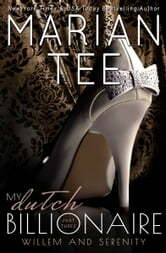 The final part to My Dutch Billionaire concluded Serenity and Willem's story to a Happily Ever After. A few months after Part II's departure, Serenity and Willem were miserable apart with neither refusing to show it. Shane played her part well as the antagonist in Serenity's life, and I thought that the change of tone in Serenity's stepmother showed her how human she was; she was rather selfish, vain, manipulative and ungrateful, but never (physically) cruel to a point of getting kicks out of it. Willem's resilient nature helped him a great deal with atoning for his sins... Part III had more heartbreak and drama, with the question every young girl asks herself on the battlefield of love: 'should I stay or should I get revenge'? Okay maybe not that question exactly, but Serenity does make some heady decisions that will ultimately lead her to her HEA. She's a young woman with no experience with men (sheltered, all-girls schools, with a protective boss) so seeing her struggle with the right thing to do was great. I recommend this to romantics and readers who enjoy a good case of drama and heartfelt risk-taking moments of love. The heroine is rather innocent and naive in her ways (though reserved), and the Dutch billionaire is a cruel man when crossed, though extremely protective over his loved ones. They bring out a nice balance in each other that many may enjoy. The best way to go Dutch!